Used Hologic 4500 SL Delphi SL For Sale. Refurbished, Pre-Owned & Reconditioned Bone Densitometers at Reasonable Prices. Used and Refurbished Radiology Equipment and X-Ray Equipment, Used and Refurbished Diagnostic Imaging Equipment, Used Cath Labs, Used C-Arms, Used MRI Systems, Used CT Scanners, Used PET Scanners, Used Nuclear Medicine Equipment, Used Mammography Equipment, Used Fluroscopy Equipment and Used Cardiology Equipment. 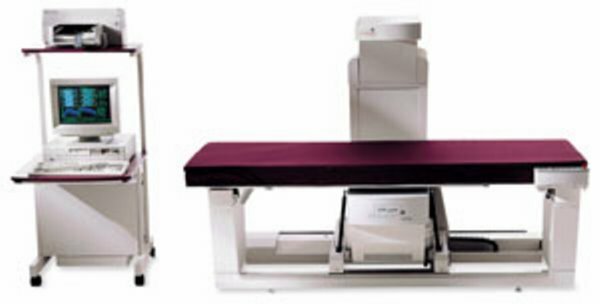 Description: HOLOGIC BONE DENSITOMETER MODEL QDR 4500SL-DELPHI SL Fan-Beam System with QDR FOR WINDOWS Version 11 Upgrade and IVA in 2006 Pre-Owned system. Year 1998. Upgraded to QDR for Windows Version 11 in 2006. Windows-based software; Multi-Array Detector System. Pentium Computer, Color Monitor, Color Printer, 1-Page Report, Windows 98, DICOM. Scanning Sites: IVA (Instant Vertebral Assessment), AP / Lateral IVA, AP Spine, Dual Femur, Left and Right Hip, Low Density, and Forearm. Can scan AP Spine in 30-Seconds. No room shielding necessary. Spine QA Phantom, leg and hip positioner included. Self-calibrated. Room requirements of 8 X 8 minimum. System has been cleaned, painted all or in part, tested and calibrated. Available in our Fort Myers warehouse. Ready for Delivery.